Outdoors – instead of the more usual indoors — with John Singer Sargent: En route pour la peche ( Setting out to Fish), and Simplon Pass — two of my favorite paintings from the Corcoran Collection. At a time when wealthy American art collectors placed European art at the pinnacle of artistic achievement – as the Andrew Mellon collection became the core of the National Gallery’s collection of Italian Renaissance art – William Wilson Corcoran saw it differently: his Corcoran Gallery, which opened in 1874, fulfilled his vision of a national collection focused on American art. He wanted to encourage “American genius. And genius is everywhere in this prime collection which, through a new agreement, has now been joined, mainly, with the National Gallery of Art. The exhibition consists of 31 paintings and two sculptures. 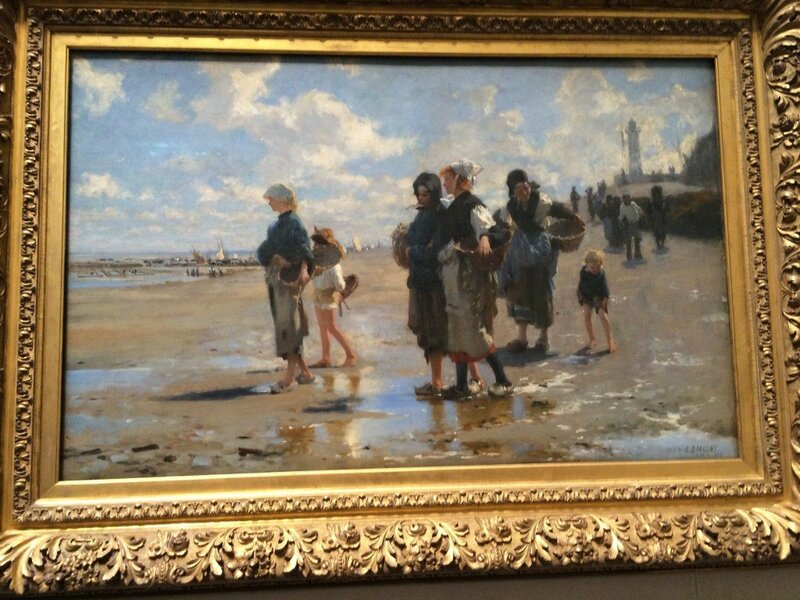 Here I’m going to take up two favorites, paintings by John Singer Sargent outdoors. Sargent is famous for his elegant and lush paintings of fashionable people – like the gorgeous one of Margaret Stuyvesant Rutherford nearby in this exhibition. But what a breath of fresh air to join him outside! And, since En route pour la peche (Setting out to Fish) was painted in 1878, during the height of Impressionism, and Simplon Pass was painted in 1911, when Cubism was well underway, the two paintings let us watch this him responding to, and resisting, these brilliant and anti-naturalistic European movements. and coming down on the side of nature. In En route pour la peche ( Setting out to Fish), the sense of the immediacy of the natural world is uncanny. It’s a painting about delicious interpenetrations, a longed-for oneness. The breezes and salt air mingle with the fishing family, the sky, the big water and the waterlogged beach are unified, the puddles flirt with the grainy sand, now one to the fore, now the other. And to the extent possible, the viewer in the gallery is there – another union. Or the lovely out there is here — or one wishes it was. 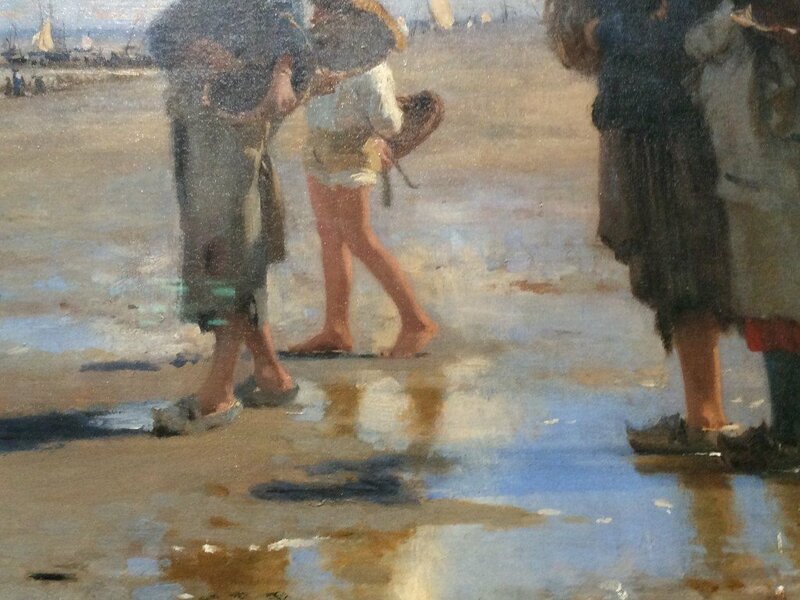 I like the variation on shoes – or no shoes – for navigating the water soaked beach. The sensuous pleasure of the painting, the union of all the elements and the fascination with light show Sargent, in this painting of 1878, thinking about the new Impressionism. But side-stepping the onslaught of light in Impressionism that dissolves the underpinnings of the material world, he maintains a vivid tactile reality — it’s wet, gritty, slippery, and the warmth from the sun is just starting to come through. 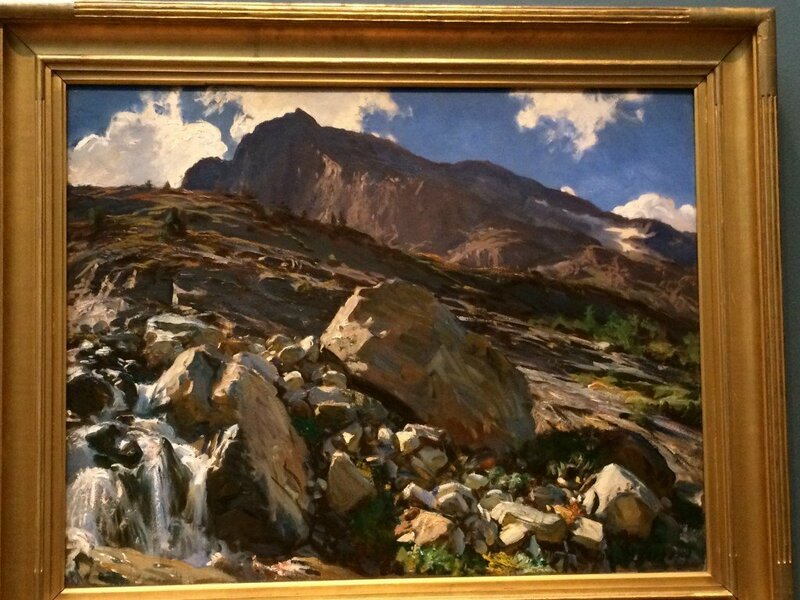 Sargent’s Simplon Pass of 1911, while it at first appears still is a portrait of energy. Things tumble — the fallen rocks lie in uneasy balance and they’ll shift again. The painting is saturated with the tension of opposites: heavy and mobile, static and fluid, matter and light. The potential energy of the rocks plays off against the kinetic energy of falling water. And energy blazes in the ranging diagonals of the composition, in the dazzling light, and — a close look shows — in the power driven impasto of the brush strokes ( van Gogh comes to mind). It’s as if looking at these rocks fills every need. En route pour la peche and Simplon Pass are both painted in oil on canvas – and what a range of effects Sargent achieves with the “same” medium. Working for sensuous immediacy and delight, Sargent uses loose pigment for the moisture laden scene of En route pour la peche, a painting of gentle colors and gentle transitions. But working for monumental strength and rocky tangibility in the mountain view of Simplon Pass, he lays on his pigment thick and dry. 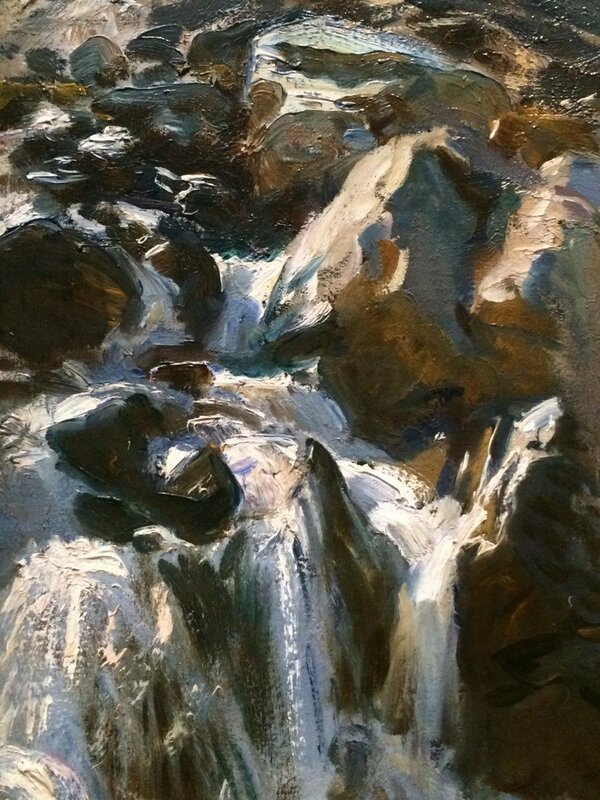 The constrained color palette and faceted complexity of Simplon Pass show Sargent’s thinking about Cézanne and of Cubism, but avoiding their stylistic displacements and multiple points of view, he stays true to naturalism, as he does in En route pour la peche. “American genius”: Corcoran knew just what he meant! Energy, vitality and optimism are everywhere in this exhibition. If you come in a little “tourist tired,” you leave refreshed. The National Gallery in Washington D. C. — our jewel of culture — is free. The exhibition runs February 6 – May 3, 2015 . After that, these and other works of art from the Corcoran will be integrated with the body of the National Gallery’s collection. For more information on the exhibition and the National Gallery, click here. The stylistic difference in these two beautiful paintings make it almost impossible to believe they are by the same artist. However, both have the mark of a great work of art…they draw the observer right into the scene. What a versatile painter Sargent was…consider the formality of his portraits , and then these gorgeous, loose interpretations . What a genius! What an incredible stylistic difference in these two works of art from the same painter, and yet one cannot help being drawn right into each picture. And this is the mark of a great painting., a painting that “works”. 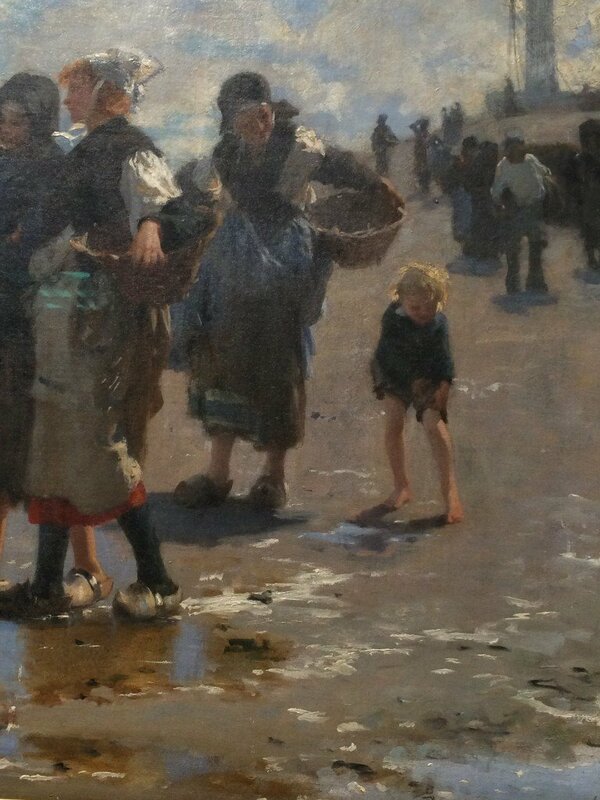 I was surprised that these two great painting were by Sargent. I very much liked them and they moved me emotionally – for the better. Your thoughtful analysis added even ore to my appreciation of these – especially Simplon Pass.